With EaaS, expertise as a service, clients benefit from around-the-clock, ongoing access to a certified WebSphere Commerce team. Subscription packages are fully customizable. 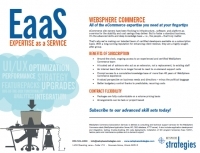 NetSphere Strategies' core competencies lie in the eCommerce realm. From services to solutions to support, our team helps our clients map out the route to success and build the roads to take them there. To learn more, download the brochure below. Improve your performance with online marketplaces while increasing the accuracy of your data and reducing your labor costs. 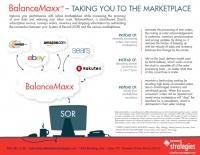 BalanceMaxx, a cloud-based (SaaS) subscription service, conveys orders, inventory and shipping information by automating the connection between your System of Record (SOR) and various marketplaces.